BALI, Indonesia, Sep 20 2014 (IPS) - When she talks about the forests in her native Kalimantan, the Indonesian part of the island of Borneo, Maridiana Deren’s facial expression changes. The calm, almost shy person is transformed into an emotionally charged woman, her fists clench and she stares wide-eyed at whoever is listening to her. “The ‘boohmi’ (earth) is our mother, the forest our air, the water our blood,” says the activist, who has been taking on mining and oil industries operating in her native island for over a decade. Deren, who counts herself among the Dayak people, works as a nurse and has had numerous run-ins with powerful, organised and rich commercial entities. They have sometimes been violent – she was once stabbed and on another occasion rammed by a motorcycle. After years of taking on wealthy corporations, Deren is now facing a new opponent, one she finds even harder to tackle – her own government. “They want to [designate] our forests as conservation areas, and take them away from us,” she tells IPS. 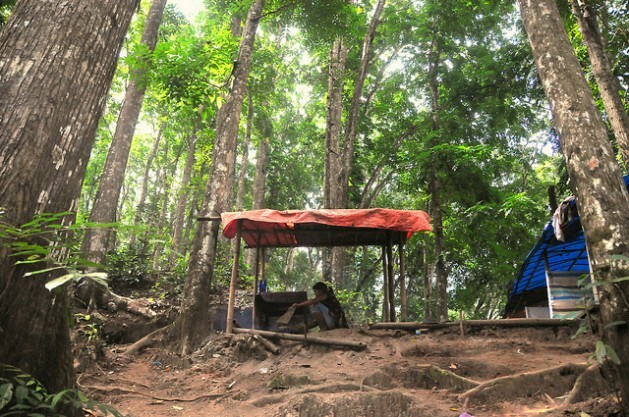 She alleges that under the guise of the scheme known as REDD+ (Reducing Emissions from Deforestation and Forest Degradation), which provides financial incentives for developing countries to cut down on carbon emissions, governments are encroaching on indigenous people’s ancestral lands in remote areas like Kalimantan. The REDD scheme, which came into effect at the close of the United Nations Framework Convention on Climate Change (UNFCCC) negotiations in Bali, Indonesia in 2007, works by calculating the amount of carbon stored in a particular forest area and issuing ‘carbon credits’ for the preservation or sustainable management of these carbon stocks. The carbon credits can then be sold to polluting companies in the North wishing to offset their harmful emissions. Now, according to indigenous communities worldwide, the programme has become just another way for interested parties to strip small communities of their ancestral lands. It is not only in Indonesia that large, multi-national and multi-million-dollar environment conservation efforts are running headlong into the interests of local communities. In the Asia-Pacific region, India and the Philippines are witnessing similar conflicts of interest, a pattern that is repeated on a global scale, according to experts and researchers. In India, activists claim, successive governments have been trying to use the 1980 Forest Conservation Act to take over forests from indigenous communities for decades. “Now they can use REDD+ as an added reason to take over forests, it is becoming a major issue where communities that have lived off and taken care of forests for generations are deprived of them,” Michael Mazgaonkar, a member of the Indian advisory board at the U.S.-based Global Greengrants Fund, which specialises in small grants to local communities, told IPS. In the northern Indian state of Manipur, for instance, the Asian Human Rights Commission reports that forest clearing for the purpose of constructing the Mapithel dam on the Thoubal River in the Ukhrul district has, since 2006, ignored the objections of indigenous communities in the region. Well-oiled global entities undermining grassroots interests under the guise of ‘development’ is a frequent occurrence, according to Mary Ann Manahan, a programme officer with the think-tank Focus on the Global South in the Philippines. She takes the example of assistance provided by the Asian Development Bank (ADB) in the aftermath of Typhoon Haiyan that devastated the country in late 2013. “It was a one-billion-dollar loan, that came with all kinds of conditions attached. It stipulated what kind of companies could be [contracted] with the funding” and how the funds could be spent, she said. “By doing that, the loan limited how local communities could have benefited from the funds by way of employment and other benefits,” Manahan added. What is clear is that the bulk of that funding goes to governments and large corporations, while only a small portion of it ever reaches the communities who live in areas that are supposedly being protected or rehabilitated. “Billions of dollars are spent on climate-friendly projects the world over, but very little of that really trickles down to the level of the communities that are affected,” Terry Odendahl, executive director of the Global Greengrants Fund, told IPS. She and others advocate for donors to take a much closer look at how funds are allocated, and who reaps the benefits. Others argue that without the input of local communities, ancestral wisdom dating back generations could be lost. Mazgaonkar pointed to the example of development in the Sundarbans, the single largest mangrove forest in the world, extending from India to Bangladesh in the Bay of Bengal. The region has long been vulnerable to changing climate patterns and the increasing prevalence of natural disasters like cyclones, typhoons and rising sea levels. He said the project went ahead, even though local women advocated growing mangroves as a more viable solution to the problem. “What is lacking is priorities on how and where we are spending money,” Maxine Burkett, a specialist in climate change policy at the University of Hawaii, told IPS, adding that a clear policy needs to be laid out vis-à-vis development and assistance that impacts indigenous people. In March, the Rights and Resources Initiative (RRI), a collection of organisations that work on land rights for forest dwellers, found that despite the hype on REDD+ it has not led to the predicted increase in recognition of indigenous lands. In fact, recognition of ancestral lands was five times higher between 2002 and 2008 than it was 2008-2013. The report warned that because of the opaque nature of carbon trading laws, governments could use the 2013 Warsaw Framework on REDD+, adopted at last year’s Conference of the Parties to the United Nations Framework Convention on Climate Change (COP 19) held in the Polish capital, to transfer the rights of indigenous communities to state entities. New RRI research released last week in the run-up to U.N. Secretary-General’s Climate Summit, said that the 1.64 billion dollars pledged by donors to develop the REDD+ framework and carbon markets could secure the rights of indigenous communities living on 450 million hectares, an area almost half the size of Europe. In order for that to happen, however, the land rights of indigenous communities have to become a priority among major donors and multilateral institutions. “Secure land tenure is a prerequisite for the success of climate, poverty reduction and ecosystem conservation initiatives,” according to RRI. Solved by 1901. Nikola Tesla’s Radiant Energy, Solar Patent. No. 685,957. Nov. 5 1901]. NIKOLA TESLA. APPARATUS FOR THE UTILIZATION OF RADIANT ENERGY. (Filed March 21 1901), 6 months prior to the assassination of the US President William McKinley in Buffalo at the Temple of Music on September 6th 1901, just 30 seconds after shaking hands with Nikola Tesla. President McKinley just returned from a speech at Niagara Falls about Niagara Falls free energy using Tesla’s Generators, Tesla’s Turbines, Tesla’s Turbine Pumps, Tesla’s Transformers and Tesla’s AC System and eventually wireless power using Wardenclyffe Towers by 1901. https://www.facebook.com/groups/656943857726255/ Tesla also invented an ozone generator that produces an unlimited amount of ozone, at a very little cost and almost no maintenance. http://rpmgt.org/588177.html “the present is theirs, the future, for which I’ve really worked, is mine” – Nikola Tesla.